This 68-page plan book tells how to turn a common propane water heater into a deluxe chicken scalder with precise electronic temperature control. 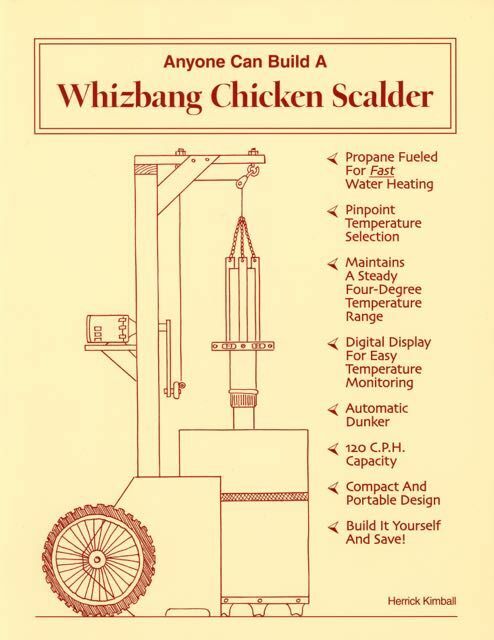 To see pictures of the Whizbang chicken scalder and get a general idea of how it works, simply click on the orange word, "homepage" (above on the right). Every small-farm and backyard poultry producer needs a good scalder to quickly and efficiently scald their homegrown poultry prior to plucking. Precise scalding translates to fast, complete and easy plucking of feathers. But high-performance, readymade scalding equiment is much too expensive for your average small-scale poultry producer to justify. And no one has ever come up with plans for an easy to make, relatively inexpensive, high-performance homemade scalder... until now. In this book, down-home inventor Herrick Kimball, developer of the world famous Whizbang plucker, tells how to build your own Whizbang Chicken Scalder. This is the scalder that the author spent two years building, testing, rebuilding, and re-testing before he felt it was worthy of being called a Whizbang. With your new Whizbang scalder you'll be able to program the exact water temperature you want, and the unit will automtically maintain that temperature within a 4-degree range. A continuous digital temperature display will allow you to easily monitor the water temperature at all times. With the auto-dunking feature, you will be able to effortlessly dunk up to three chickens at a time, giving you 120 chicken-per-hour capacity. The Whizbang scalder is sized to process chickns only. But the same burner, temperature controls, and dunker used to make the chicken scalder can be employed on a scalding tank with larger bird capacity. This book tells you everything you need to know to make the ultimate homemade poultry scalder. YourWhizbang scalder will faithfully and precisely scald thousands of birds for years to come. Better yet, it will make poultry processing so much easier.